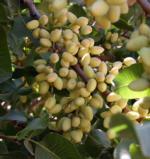 Pistachio trees require long, hot, dry summers and mild winters. April frosts kill flowers, and cool summers do not promote good kernel development. Adequate winter chilling and good weather (pistachio is wind-pollinated) are required. Pistachio trees are dioecious (male and female trees); thus, male trees must be planted near female trees to get a good crop set. Trees become large and should be planted about 20 ft. apart. The warmest regions in the state are adapted for pistachio production in the backyard, but pistachios are a poor choice for coastal California.